Mid America Motorplex is basically my ‘home’ track, so I was expecting to do well here. The car had a few issues after the last event, and I ended up having to install a new transmission because my old one was basically munched. However 100k+ miles, and 20k+ miles as a track car will do that I suppose, especially at 175% of stock power. I was also able to have some time to throw in my new bushings all around, which definitely tightened up the suspension. All in all the car was feeling pretty good. I was able to test drive it a bit at the local hot-rod weekend and it passed quite well. After our requisite thrashing about to make it down there, we were able to get a little sleep. Saturday dawned bright and warm. I brought alot of drinks this time, but I didn’t have any ice. (Mistake #1) Anyway, the warm up session was pretty uneventful, except that it was obvious that it was going to be hard to get good times. The power on the car was already down, the temps were in the mid-80’s even at 9am! I turned the water on, and didn’t turn it off again all weekend, even at 11.8 psi of boost. The day went pretty well after that, although we were looking for air conditioning non-stop. My car ran pretty well, and my driving was ok, but the temps were definitely not helping. I saw the highest temp I’ve seen on the water during one run, 105C. Air temps even with the water on were getting close to 50C. Now in general, these are not high temps for a RX7, but for me they were pretty high. The car definitely had less power at those temps, the ECU is set to start retarding timing and dumping fuel so that seems to be doing its job. Of course it’s not as much fun. Fortunately since I know the track pretty well I was able to go out and run hard in the first timed session of the day. Since the conditions just kept getting hotter and hotter all day there was no way for anyone to catch me later on. I ended up winning the class by only .047 seconds over Derek! The bad news for the day came during the A race though. Damian was forced off the track and into the grass by someone who lost track of where he was in corner 12. He was able to save it and steer back on-course, but two laps later he had to put with excessively high water temps. When he rolled in the grass literally fell out of the nose of the car in clumps. Basically there was no air at all going in the nose for two whole laps. (Mistake #2) Next time anyone goes into the grass we’re coming in immediately to check for blockage. Anyway the motor ran fine, but after it cooled and he went back out for a TT session it was done. No compression in 2 faces of the front rotor. Unfortunately this was to be the first 2 hour enduro race of the year as well. There was a NASA pizza party during the evening, but Damian, Ben and I missed out on most of the food so we took off for town to grab something. We got back and expected the video party to be going, but apparently everyone though we were in charge and had given up and left/gone to bed. (Mistake #3) We headed out for the obligatory track walk and got some sleep. I concentrated very hard on my driving for the last session since I knew it was going to be difficult to try to beat Derek even with the hot temps. I got 2 laps in before the car got warm and slowed down again but I didn’t know if it was enough. While we were packing up I saw Derek drive by pointing to me. He had seen the sheet and I got him by .7 seconds in the last session to take the win. Woohoo! We were able to start packing up fast, but since we stopped at Outback on the way again it took a while to get home. All in all the weekend went fairly well for me, Ben also won both days, but for Damian it was a bit rough. He’s going to try to get the backup motor together for the next NASA event in 3 weeks. OK, this is going to be a pretty big update. 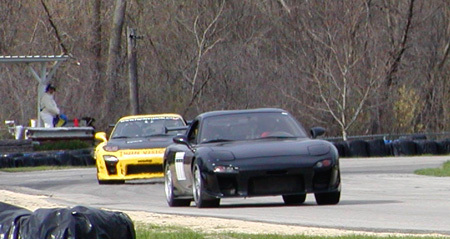 We (s2k Ben, rx7 Damian and I) headed to Iowa Speedway over the weekend of the 28th/29th of April. This was a exciting deal for a bunch of reasons. #1 is it was the first race of 2007. #2 is that we had just tuned and dyno tested our cars and they were running pretty well. #3 is that Iowa Speedway is a roval, with a NASCAR style banked turn on one end and a infield section on the other. #4 is that it’s only 4 hours away!!! Anyway, with all that in mind we packed up and headed down on Friday afternoon. Was probably the best we’ve ever left for an event. The cars were actually loaded the night before and we only left about 2 hours late… so the weekend started well. Didn’t have any trouble getting there and because we made good time we had a little time to look around the place before they let us in and we could get some sleep. Unfortunately there was a drag race going on, so we had to wait for those people to leave, but the facility was huge so we spend the time nosing around. Eventually they let us in and we did a quick track walk before setting up the sleeping bags outside on the asphalt. Fell asleep dreaming of 15 degree banked turns. Morning dawned early and hot. The plan for me was to run the street tires for the first 3 sessions of the day, switch to the R-comps the last session and heat cycle them (and check to see if they will not rub terribly) and then use them all day sunday. I was running my tuned boost level and everything seemed to be well with the car when I was getting it ready to go. The first sessions went pretty well, the car felt strong, the tires were actually surprisingly good, and the track was pretty dang fun. The high banked turn was of course the highlight, and you could enter the turn at close to 95mph, hold that til mid-corner, and then full accelerate off the exit. You had to be careful though, as the banking leveled out on exit, so by that point you needed to be pointed down the track and not at the wall! The only bumpy part was the transition from the oval to the infield, and depending on your line that could be smoothed out some as well. All in all it was pretty fun, if a bit short. The lap times were basically all sub-one minute. Unfortunately in the first couple sessions I was black-flagged a couple times, once because I had something hanging outside the door on the car, and once because they said I missed a yellow. Niether was a big deal, especially since their flaggers were really not doing what they were supposed to be doing. It was an all new crew since we were the first ever car club to run there and they need a bit more practice. I did end up missing 10-15 min of track time because of all the issues though. Since this is a NASA event, after lunch we got to watch the races. It was hot, and there was alot of action out on the track. Eric had his toterhome there and he had scoped out the best parking spot, so we were able to watch from the top and see nearly the whole track. Damian did pretty well, and even though he was traditionally way late to grid and started from the pit lane because of some issues with other cars ended up coming home in P1. Very nice for the car’s maiden voyage with the new setup. so I did circles in the pits and even at 5 mph is was apparent. Shane from AIM Tuning was walking past, so I asked him to jump in a second and see what he thought. We decided it sounded like it was exactly in time with the revolution of the wheel, and the right side was definitely worse than the left. Unfortunately nothing could be done quick, so I parked it and went to work. I pulled off the right side tires and had a look. Everything was tight as far as I could tell, and the wheels, tires and lugs all were good… One thing I did notice was that the stickers were all bunched up… and they were metal. Hmmmmmm…. Went over to the NASA sponsored supper (Thanks!) and asked Shane if he throught stickers could do that. He asked me how big they were, and I showed him (about 6″x9″) and said they were metal. He started laughing hysterically, so I took that as a yes. All that nasty noise and sliding etc etc was just the stickers!?!? Ben and I made a plan to go up and do laps in the upper parking lot to wear off the stickers and see if the tires are going to rub. As we headed off to do that before it got dark, I heard Shane telling someone else about the stickers. Jerk. Anyway, we scrubbed off the stickers and definitely the tires would rub, but it didn’t seem too bad. Worth a shot sunday morning at least in the warmup session. We spent about 30 minutes making ourselves sick and getting them up to temp, well as high as we could anyway before heading back. About that time Eric was firing up the keg and the movie setup so we could watch some in-car footage from the days events. A few hours later everyone had had enough and Damian, Ben and I did one last trackwalk eating cookies and discussing lines for the next days events. Day two went pretty well also. My tires rubbed, but it wasn’t terrible, so I ran them. I was slow to grid a couple times, so I missed at least 15 min of track time because of that. Didn’t get as good of times as I was looking for either, but the bigger sized tires were definitely hurting my acceleration. On the plus side, there was alot more grip, and the car felt planted again. I probably wouldn’t run that size tire again, since it rubs though. Plus the way the NASA rules work I can get a few HP back if I go back to the other size. We’ll see how it works out for NASA nationals. Anyway, the racing was on again after lunch. Some attrition had taken place, and there was alot less action Sunday, but it was fun anyway. Damian and I had the radios working, which was good, because about 1/2way through he blew a boost hose and had to come into the pits. This was further complicated because we were trying to get some good video of the race. I left the camera and took off running for the pit area. I fixed it using borrowed tools and he went back out only to have it pop off again. He circulated to finish the race at half speed. Time for a bit of re-engineering there. In the last session of the day Damian and I were chasing each other around and having fun when I had a momentary lapse. I was doing the thing you’re not supposed to, watching the mirror instead of the road. In this case it was only a second, but that was long enough to power oversteer the car off the road. Wouldn’t have been a big deal except that there was some washout because of the rain so I ended up cracking a sideskirt on the passenger side and getting a bunch of rocks in the wheels. Ouch. Lets try to avoid that in the future. My local Discount Tire guy was nice enough to remount the wheels for free but the sideskirt had to be replaced. Ouch again. Finally got the images of the dyno sheets into the gallery. Also, just had the first NASA event last weekend, will get a post for that going soon. Had the dyno day for the upcoming NASA Midwest season opener. Went quite well. So, after all those changes, I finally get to drive the car again!!! This was the first 2 day event for Find the Line, so it was a cool deal from several angles. We had 50+ people there on Saturday, the car has good brakes for the first time in a long time, and lots of runtime on a track where I have a fair amount of local knowledge. First couple sessions went well, I could immeditately tell that the brakes are now much better than before. Even in the last lap of the session they are essentially the same as the first. This is a major win for me since last year was brutal from a cost and usage standpoint. Also, I need to work on the Tuning a bunch, because it is mega rich and not running that well up top. Knew this before, but it’s really evident now. Flames are cool but in this case it’s hurting me. We did figure out a couple things on the track too, a couple more turns I now am comfortable on, and it showed in the times. Even though it was pretty bloody cold I was able to drop another second or two down to the 1:40 range. Very solid for me running on RA-1’s and about 300ish RWHP. We had a bunch of really cool sessions out there, Ben with his s2k, Damian with the rx7 and then all the other FTL regulars. I have pics up in the gallery that show the ’session’ right before lunch on Sunday. Very fun time had by all. No damage to the car either. Ok, it’s been a while since I updated the site. A long while. Doesn’t mean I’ve given up, just that I needed to regroup. My goal this year for the site is to try to keep a weekly log of what’s going on with the car and the events. Fix up the nose that was damaged at Mid-O. Fix the fenders that were pulled out when I ran Damian’s tires. Make the drivers seat more comfortable for me to drive in. Get the car up to NASA tech specs. Fix my massive oil pan leak. Prep the car for NASA TTS competition. Make the car able to run 20+ min without fuel starving. Then there was a bunch of other smaller fixes and upgrades… You can look at those on the sheet. Most of the biggies got taken care of. With the help of the forums, I resealed the oil pan, and that seems to have stopped the leak. The nose fiberglass was repaired with the help of Bruce L. and resprayed brilliant black by a local shop. The steering setup was changed by installing a smaller steering wheel, a 3″ spacer, and then custom mounting the cruise control buttons etc. The NASA tech specs really only required the updating of my harnesses, as the old ones were expired. Sold the old ones and bought new ones for a net total of $75 spent. Not too shabby. I rented a fender roller and spent an evening fixing destroying my fenders. Great fun. Did get them rolled properly, but it blew up the paint pretty bad so I spent another night repainting them. If I was to do this again I’d save the tool rental fee and just use the shop vac plastic tube that worked just as well. The braking system did end up getting updated, but not like I originally expected. I had in my mind that I would probably save up and get the Stoptech ‘race’ front setup and run the RS/RZ rear setup to balance it out. Of course, that meant ~ $3000 out of pocket. Ouch! 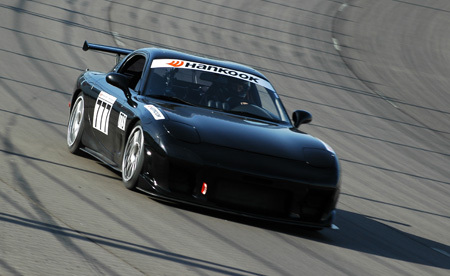 Somewhere in December there was word of a new 4 wheel *balanced* setup being developed by Racing Brake on the forums. They expected it to cost less and work better than all the kits out there. Problem is, it wouldn’t be done until at least mid April, and my first event was April 7-8 with Find The Line at MAM. It likely wouldn’t be possible to get a kit before the 2nd event (NASA Midwest at Iowa Speedway) either. So I could run the stock brakes again and burn up another $500-600 in pads and rotors and have marginal braking for those two events or go with Plan C, Damian’s old Porsche 911 TT setup that he was trying to sell. Given that I’ve driven his car with the setup and I know how well it worked and the timing and pricing I had to try it out. The only issue would be that the brake bias would be off because of the small rear stock brakes. I could fix that by picking up the Racing Brake rear setup though when it became available and hope for the best. In a couple months I’ll know if this was a good choice. To fix the fueling issues, I decided that I needed to fill the fuel tank with foam to prevent the sloshing. A couple people from the forums also tried this and it worked pretty well for them. In the meantime, one of the forum members was also researching the issue and found another way to keep the fuel in the pickup bucket under cornering. I got in as a beta tester for his product, so I will be able to get that running by the time I hit the first NASA event. The combination of those two should solve this. I think. That brings us to the last one… TTS prep. This is a long topic that I’ll ignore for now and update sometime in the year. The rules are up on the NASA TT website if you want to check them out. That is all for now, I will have an update about the first event as well as pics of all the changes on the car soon. I missed writing about the FTL held the week after the NASA MAM event. That one went well, lots of cars and lots of people. Had a great time and the car ran great again. Everyone should come out to these events as you get a ton of track time for not alot of cash. This post is about the Autobahn event though. This was another great weekend for me. Ben A. came out with Damian and I to Autobahn CC in Joliet IL. This ended up being a 3 day event, with one day of practice and 2 days of TT competition for me. Plus, being a NASA event, even when you’re not running there’s a bunch of race classes to watch. I started out running my RA-1’s and they were cold and I was rusty. Almost spun in the first session. Did learn what not to do in terms of trying to recover though. I had the suspension way to soft, the tires didn’t have enough pressure and of course everything was cold. On the plus side, after a few sessions out there Ben and I were tearing it up. And by tearing it up, I mean my brakes. Tons of fade, and I ate through a set of new pads and rotors quickly. By the middle of the second day, I was totally through them both. Times were dropping consistenly, but most of the TT guys were beating me up. Swapped out the pads for some HT-10’s and the rotors for a new set and tried to bleed the brakes as best we could. By the end of the second day I was getting low on brakes. Sunday was a new day, and after warming up the first session Damian let me use his second set of hoosiers. It was a pretty silly transition from one to the other. They are not even remotely close to the same, and the RA-1’s are not bad. Took me a couple sessions to get used to them, but my times immediately dropped 1.5 seconds and dropped another second by the second time out. The last session I took Ben out again for the first time on the Hoosiers. We had basically no brakes left, but there was only maybe 8 other cars left out there (down from a high of 50!) so I went one hard lap, then coasted a lap to let them cool, then one hard lap, etc etc. He was laughing because of the difference in the tires. We ended up dropping even more time off (with a passenger!) and I ended up 2nd overall just behind Jon in the 500+ awhp race Evo. We met him on the One Lap as well, it’s a silly car. I talked to him and they were impressed with my car, since I’m at about 60% of their power and yet I wasn’t falling back when he passed me. All in all a great weekend. Car ran great, Tons of fun stuff going on and people and food. Just really really tiring. After a longish layoff for the OneLap with Damian (onelap06.myrx7.com,) it was time for another event with NASA running TT, this time at MAM. The car drove/ran really well the entire event, with the exception of one wierd session Sunday morning. Didn’t see anything wrong, and it was fine after that so I’m not going to worry about it too much. The event was my test for the new water injection system I installed, and it went really well. The weekend was an excellent test because of the high ambient temps. On Saturday I ran the first (and coolest) session without the WI system on, and my intake temps went as high as 50 or so degrees C. Second session it had warmed up a bit, but the intake temps were below ambient at 27 C! I did however run through the entire tank of water in 15 minutes though, so I had to crank it back to 50% for the next run. Again the temps were 29 C, even after it had warmed up again outside. I cranked it back another notch and the temps stayed the same for the last session of the day. Overall a resounding success. We have another even coming up this weekend and I’m going to play with it a bit more. After the temps dropped so much, the tuning was all out of whack, there was way to much fuel, to the point of the car not firing at high RPM. I will need to tune some more. Well, another weekend, another track event. This one was at Blackhawk Farms raceway, on the Wisconsin/Illinois border. Thankfully this time I had (new) proper track brake pads and everything went real well. My RA-1’s are still holding up, and since I left them full tread when I bought them they came through huge when it rained a bunch on Sunday. My lap times in the semi-dry were nearly the same as the totally dry Saturday, and I was able to lap as fast as the NASA race cars in the wet. Normally I’m off their pace by 5-10%. It was also amazing that even in a total downpour I could hit 100+ on the main straight and the car felt pretty stable. For those that don’t know the NASA weekends have alot of different groups all running in one day. 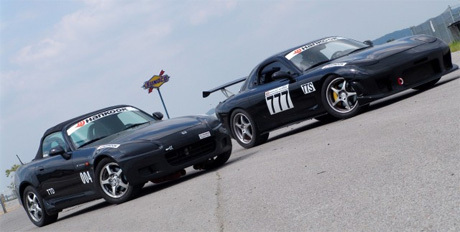 They have everything from completely new people on their first track day running with instructors to full out 750hp race cars in sprint races. It makes for a really interesting group of people and mix of cars to watch. I had talked to Bill Marquardt about running the Time Trials via email and he had told me that NASA requires people to move up from HPDE1-4 and then progress to time trials. Since I had run a HPDE3 day already, they would let me start there, and if everything went well, then I’d be able to progress to 4 and TT the second day. Well, it all went really well, and by the third session on Saturday I was in 4 already. The 4 and TT run group is combined and also open passing so it’s about as close to racing as you can get, without actually doing it. The funny part was, the timing/scoring people thought I was in TT already, so I ended up with a trophy (for 2nd place behind Damian) even though I was not actually competing. Oh well, the second day I did beat him up, because I got a dry run in the morning and he only got to run in the wet in the afternoon because of his competition school classes. All in all, another successful weekend at the track. I of course have another 6 hours of footage, and no time to spend turning it into a cool video, but hopefully at some point I’ll get that together. I do have that second Autobahn video that I promised a while ago nearly complete, so that will be up fairly soon. 93FD is powered by WordPress.